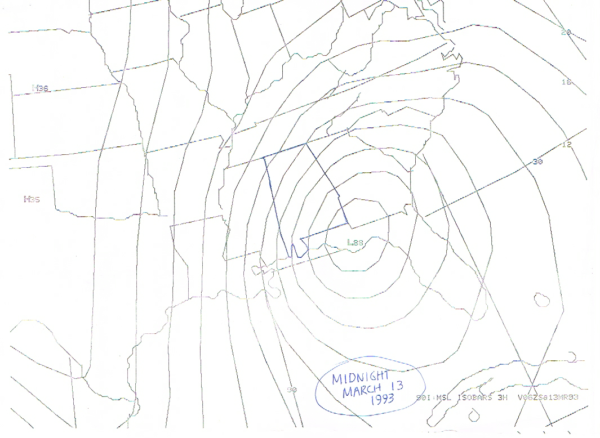 This is the twenty-fifth anniversary of the historic storm that impacted Alabama and much of the eastern United States on March 12-13, 1993. 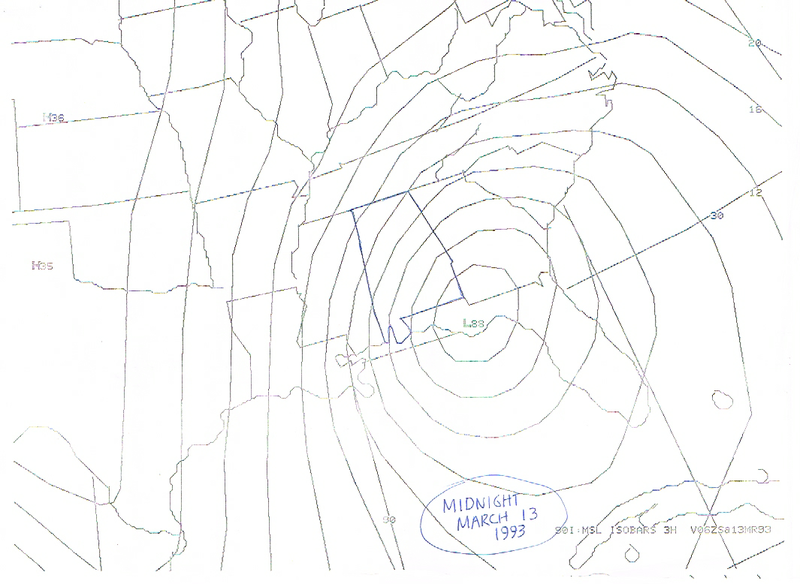 A computer generated surface chart from J.B.’s files from 09z on March 13, 1993. Some know it as the Superstorm. Others as the Storm of the Century. Many just call it the Blizzard. But for those that went through it, it is a storm they will never forget. Snow was reported in all 67 Alabama counties. Actual blizzard conditions and thundersnow affected Birmingham as the powerful low-pressure system moved across the Florida Big Bend area with a 12-foot storm surge, a derecho and tornadoes across the Sunshine State. The system was well forecast, with model output hinting at the power of the system by Monday, March 8th. It was hard to get people to take a snow forecast seriously since temperatures were in the 70s. Birmingham recorded highs of 73, 73, and 75F on the 8th, 9th and 10th. Special weather statements were put out by the National Weather Service in Birmingham on the morning of Wednesday the 10th. A winter storm watch was issued on Thursday afternoon and winter storm warnings were issued early Friday morning. By the end of the storm, Birmingham officially measured 13 inches of snow, making it our largest 24-hour snowfall, our biggest storm total, and maximum snow cover. EVen higher amounts were reported across parts of Alabama. Record cold followed the storm, with a low on the 14th of 2F at Birmingham. James, Brian, Scott and I will be posting some of our video recollections about the storm here on AlabamaWX. I will start with a story from our late, great mentor J.B. Elliott. We don’t have video from J.B. about the storm, but he penned this neat account in 2007.